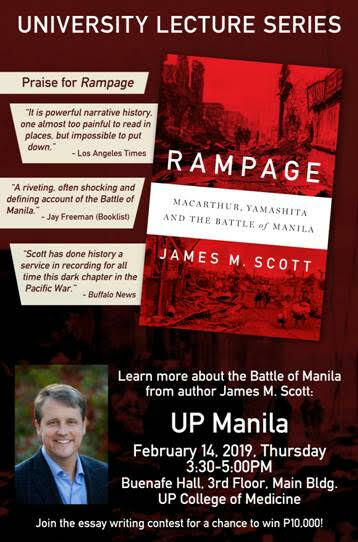 University Lecture Series with James Scott: "RAMPAGE: Macarthur, Yamashita, and the Battle of Manila"
The Social Medicine Unit of the UP College of Medicine will be hosting a talk by James Scott, the author of the recently published book, "Rampage". This will be held at 3:30 to 5 p.m., 14 February 2019, at the Buenafe Hall of the UP College of Medicine. Invited are all UP Manila constituents, and others who may be interested in battle of Manila during World War II - an important part of the local history especially of the PGH. Representatives of local historical institutions have been invited to react.